Here is a variety of rather unusual paper toys, all free for you to print out on heavy card stock and enjoy. 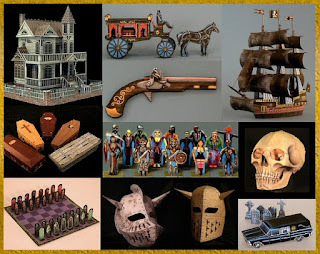 The toys include a hearse playset, coffin gift boxes (with occupants), a little cemetery, several unusual board games, a few dark gloomy haunted houses, several horrifying monsters, and quite a few other dark delights. Pick out some toys, print out the pattern pages, and with a few common supplies like scissors and glue you're ready to create all these strange little curiosities. I hope you'll enjoy them all. • THE BLEAK ESTATE - Everyone agrees that this house is haunted, but there's a lot of uncertainty regarding who exactly might be haunting the place. • THE BAND - These three fellows grew bored with just lying around in the cemetery, so they've decided to form a band. • THE GHOST SHIP - this ship may need a few repairs, but I'm sure the ghostly crew that remains aboard will be delighted to offer you their assistance. • THE LIGHTHOUSE - This lighthouse is very old and said to be extremely haunted, both by the ghosts of it's former keepers and by whatever drove them insane.